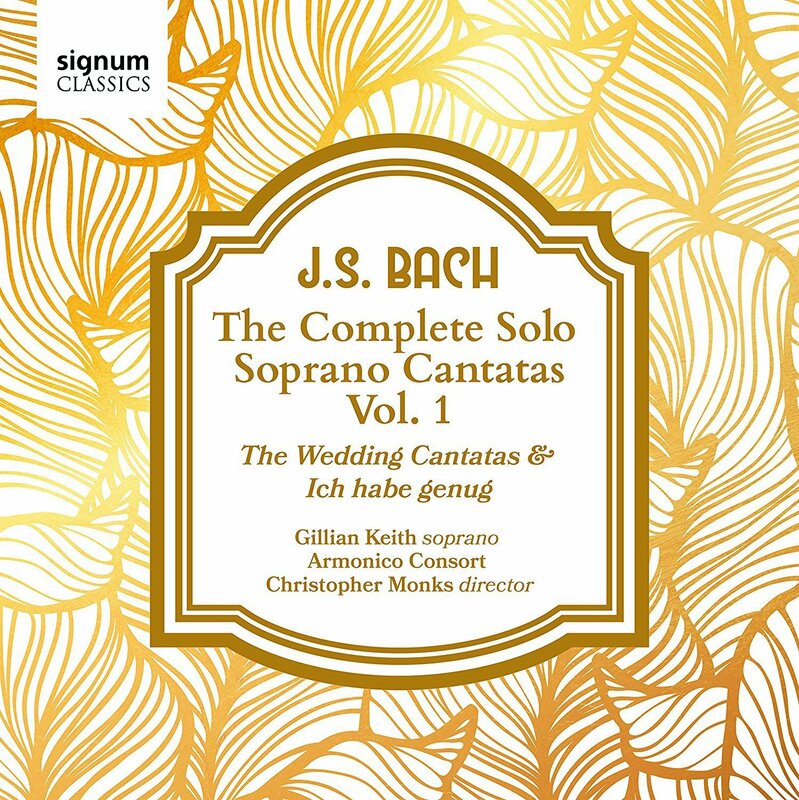 This disc from soprano Gillian Keith, the Armonico Consort, director Christopher Monks is volume one of Bach's complete solo soprano cantatas on Signum Classics. This volume includes the two wedding cantatas Weichet nur, betrubte Schatten BWV 202 and O holder Tag, erwunschte Zeit BWV 201, plus one of the best loved cantatas, Ich habe genug BWV82a. The project is a very personal one for Gillian Keith, in her booklet note she talks about the recording as being the realisation of a personal dream and funding for the project was raised through Kickstarter.com. They start with Ich habe genug, a cantata which Bach re-visited on a number of occasions. This version is for soprano and solo flute. The Wedding cantata Weichet nur, is rightly one of Bach's most popular but we have no way of knowing for whom it was written. Gillian Keith in her excellent booklet note suggests Anna Magdalena Bach's wedding to JS Bach. Here we have a glorious oboe obbligato. The final work on the disc is one of the longest of Bach's cantatas, O holder Tag, another wedding cantata, this time with oboe d'amore and flute obbligato. The long recitatives have an almost operatic feeling, something which Keith brings out. Throughout, her diction is admirable and clear, you hardly need the printed text. Keith keeps a light interpretative hand on the music; she conveys meaning with poise, but does not present these pieces as intense devotional music, instead taking the music on its own terms. The cantatas are recorded very much in chamber format, with just one player per part and William Whitehead playing a chamber organ. 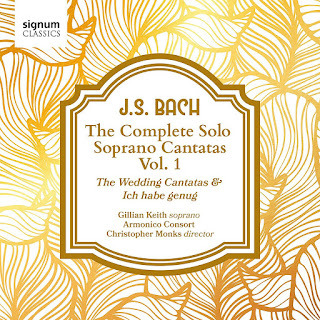 Bach's cantatas lend themselves to a variety of interpretations and performance styles partly because the music is timeless and can stand widely differing interpretations. And, of course, with the solo soprano cantatas in particular we have no way of knowing quite how Bach's boy soprano soloists would have sounded. Certainly they must have been gifted, these are not easy pieces, though Bach's trebles were almost certainly far older than their modern equivalents. But in many ways, Gillian Keith's recordings is a daring move against modern orthodoxies. There is no doubt that she has the technical ability to sing these piece, Richard Strauss's Zerbinetta is in her operatic repertoire. But here is nothing boyish or white about her voice. She is a lyric soprano, but sings with a vibrant, vibrato-let tone. The vibrant quality of her performances is matched by Christopher Monk and his players. This is the sort of performance which rather than aiming at perceived levels of period performance, aims at a different sort of authenticity, with the artists being true to Bach's music in their own style. I enjoyed these performances immensely but Keith's distinctive performance might not be to everyone's taste.